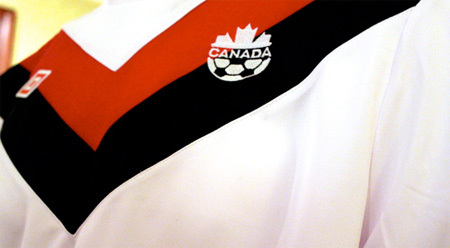 With the announcement of Umbro coming back on board to manufacture Canada’s uniform through 2014, and reaction to the new design Canada will be using for 2011, it seemed appropriate to pop in the betamax tape and see how the new look Canada stacks up against strips of years past. To say the last 30 years of Canada’s strips, in terms of design and style, are somewhat underwhelming would be an understatement. With arguably only one design able to stand the test of time and fall into the ‘classic’ category, it would seem that the expressions “look good, feel good” and “dress for success” have not often been part of the equation. With Umbro having a roster of some solid-looking uniforms currently being used in both club and international football, Canada supporters should not feel too aggrieved that, for some, the 2011 uniform does not deliver everything hoped. Seeing what Umbro has produced around the world (likely with more lead time), the 2012 strip should garner more unanimous support and be closer to being right on the mark. 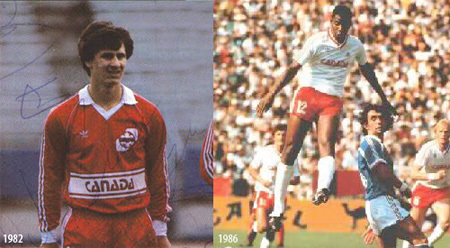 With that said, here is a look back at what Canada has stepped on the pitch with from the early 80s up to what will be worn for the first time February 9 against Greece. If there’s one uniform, or one era, that embodies Canadian soccer it’s the 1980s with their lone World Cup appearance in 1986. The style and design that Adidas put forth through the 80s, that ultimately has proven to be tightly associated with this decade, can be seen in a uniform that had all the classic features one would expect. Aside from a logo that has never quite transcended into being retro, a font that says space exploration more than soccer, the clean, simple style of the 1986 uniform, as well as red-on-red and red-and-white combinations, is one of the few, if not only, Canada strip supporters can rally around. It’s hard to believe that one day in the near future it will be cool again to wear raver pants, listen to Limp Bizkit and shirts like these won’t look ridiculous. VERY hard to believe. 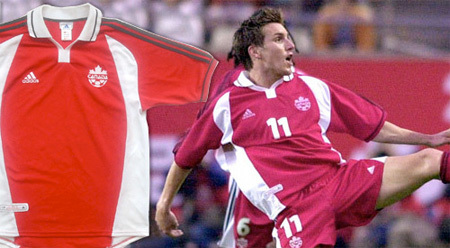 The one thing you can say at least is that Umbro’s first crack at designing Canada’s strip certainly wasn’t boring. Although none of these have made it into one of the classic “Top 10 worst football kits” blog posts alongside Hull City, Norwich City or Man Utd., it’s probably more to do with the low profile of the team through this decade rather than any of these not being horrendous enough to make the cut. From the Score manufactured strip that would have been cooler if used on the PGA Tour to pseudo Canada hockey jersey, at least they fit in with everything else that embodies the 90s. Ahhh Jimmy B what a talent you were! There is serious doubt that the rebranded Adidas logo will ever be as iconic as their original one, and as a result the same can be said for any of these uniforms from the last decade. Although there may be an argument for the solid white panels, outside of what was worn in 2002, the last few years Canada’s strip has suffered from a complete lack of any personality. From the comic-sans font to the obviously generic stock design, the Adidas kit from the last few years, although simple, is completely forgettable. Especially when stacked up against some other nations that Adidas has manufactured, it almost becomes disappointing. Well here it is again – everybody’s favourite unit of highway safety measurement – the chevron. While this represents the same stock option that can be seen at San Martin in Peru, as noted earlier, with little time to develop and bring something 100% custom to the table, there should be confidence that future strips will be even better. With 2012 being a centenary year for the Canadian Soccer Association, and with Paul Dolan of Umbro already stating they plan on doing something special with the uniform, there is reason to believe that they will deliver something memorable and timeless. 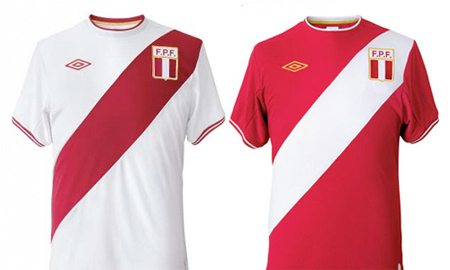 One needs look no further than one of Canada’s friendly opponents for 2010, Peru, where they were able to get it spot on, as well as put out some classic strips for a handful of their domestic clubs.